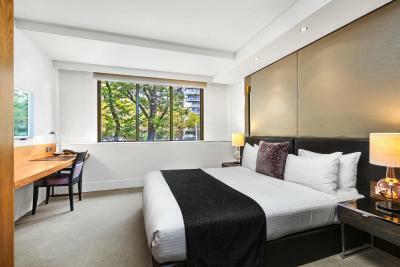 Lock in a great price for Royce Hotel – rated 9 by recent guests! We didn’t have breakfast at the Royce but would have been nice to have been offered it as a hotel was only half full of residents and we thought we might have been bumped up as this but time we stayed in a more expensive room. The location is nearby tram. The room is clean and cozy. The beautiful surroundings snd architecture Staff were extremely accommodating and went out of their way to help. Steve especially. It was very unique and luxurious. The breakfast was fabulous and the overall feeling at the hotel was relaxed. We'll definitely recommend to family and friends and book another weekend away ourselves. Comfortable room, friendly service, and great location. Royce Hotel This rating is a reflection of how the property compares to the industry standard when it comes to price, facilities and services available. It's based on a self-evaluation by the property. Use this rating to help choose your stay! 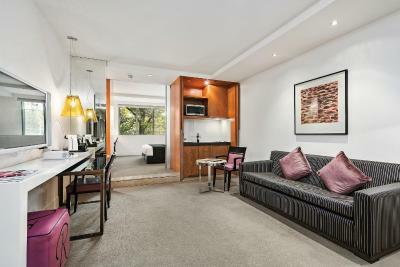 Located on St Kilda Road, next to Melbourne Grammar and the Royal Botanic Gardens, the 5-star boutique Royce Hotel features an on-site lounge bar, and restaurant. 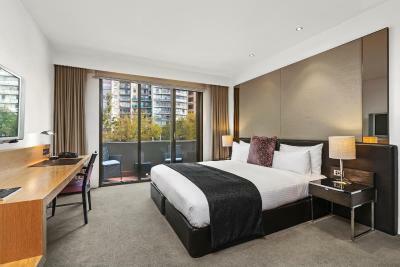 Guests have a choice of stylish rooms and suites each with views of Melbourne's city skyline or a tree-lined St Kilda Road and a 55-inch plasma-screen TV with complimentary new release movies. Some accommodations features a spa bath. You can work out at the fitness center or unwind with a massage. There is a 24/7 front desk and a private outdoor courtyard. Concierge desks are available on site. In 2016/2017, the hotels restaurant, Dish, was awarded 2 Chefs Hats. It offers a warm and friendly atmosphere with a range of modern Australian dishes and an extensive list of local and imported wines. You can also enjoy drinks at the stylish Amberoom lounge bar. 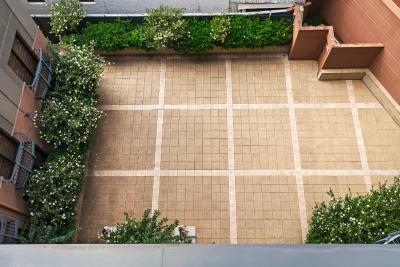 Fawkner Park & Tennis Courts and Albert Park Lake & Golf Course are within walking distance. 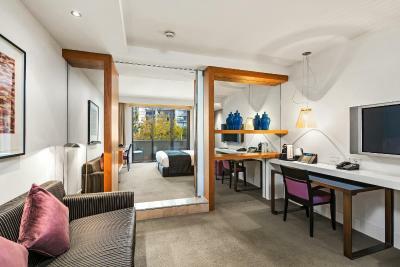 Melbourne's theater district, Federation Square, NGV, Arts Center, Southbank, CBD, Melbourne Cricket Ground (MCG) and the fashionable Chapel Street are all within a short tram ride. When would you like to stay at Royce Hotel? This air-conditioned room features a 55-inch plasma-screen TV, complimentary new release movies, a large work desk and an Italian marble bathroom with a shower. Some rooms also include a CD player and a 55-inch plasma-screen TV with complimentary new release movies. Private parking is available at a location nearby (reservation is needed) and costs AUD 40 per day. 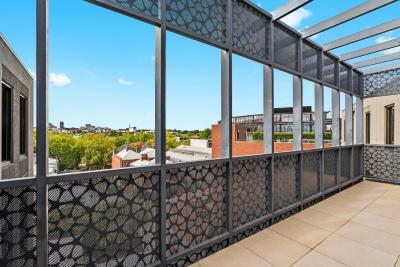 This room has a balcony with views of the city or gardens. It also includes a 55-inch plasma-screen TV with complimentary new release movies and an Italian marble bathroom with a shower. Some rooms have a CD player and a 55-inch plasma-screen TV with complimentary new release movies. This 2-story loft style room features a separate lounge and powder room downstairs. It also includes 2 55-inch plasma-screen TVs with complimentary new release movies and a marble bathroom with a shower upstairs. There is a 55-inch plasma-screen TV with complimentary new release movies. A sofa bed is available on request prior to arrival, at an additional charge. 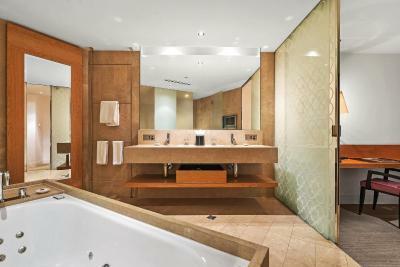 This room features an Italian marble bathroom with a spa bath and an LCD TV. It also includes a 55-inch plasma-screen TV with complimentary new release movies. Some rooms include a balcony, subject to availability upon check in. 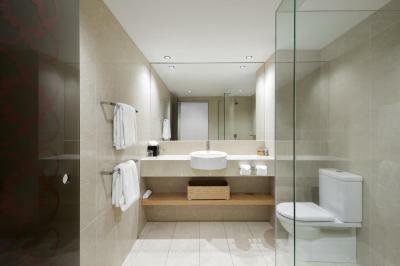 This suite features a lounge area and an Italian marble bathroom with a spa bath and a separate shower. It also includes 2, 55-inch plasma-screen TVs, complimentary new release movies, a CD player and an iPod docking station. Some suites include a kitchenette or balcony, subject to availability upon check in. Sofa beds are available on requests at an additional charge. 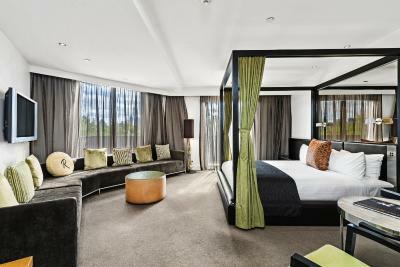 Located on the top 2 floors of the hotel, this suite features views of the city skyline, gardens and the Shrine of Remembrance. 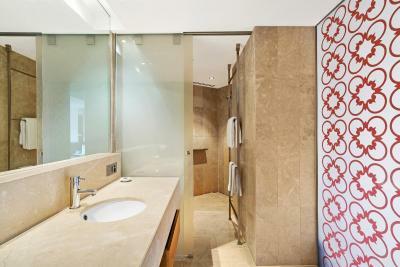 It includes a 4-poster bed and an Italian marble bathroom with a spa bath and a separate shower. It also features a 55-inch plasma-screen TV, complimentary new release movies, a large work desk, a CD player and an iPod docking station. There is a 55-inch plasma-screen TV with complimentary new release movies. Ther is a 55-inch plasma-screen TV with complimentary new release movies. 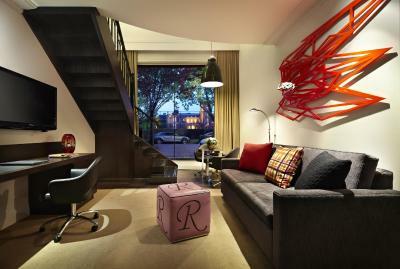 House Rules Royce Hotel takes special requests – add in the next step! Royce Hotel accepts these cards and reserves the right to temporarily hold an amount prior to arrival. Please note that there is a 1.5% surcharge when paying with Visa or Mastercard credit cards and there is a 3.3% when paying with American Express and Diners Club credit cards. Construction that is being done - nothing to do with the hotel though. Breakfast was great - not far to walk to the city. The room was a great size and extremely clean and tidy. The hotel staff were attentive, courteous and very helpful. The Amberoom was a great bar where we had a few drinks before heading out to dinner. Definitely one of the better hotels I’ve stayed at. 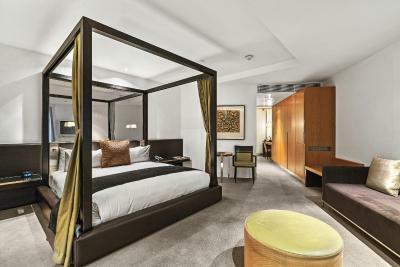 Would absolutely recommend the Royce Hotel to anyone visiting Melbourne especially if travelling with that special someone. There’s definitely something romantic about this hotel. Highly recommend!! Great all round. There must have been a change in ownership / management because all of the small things have been improved and adds up eg. Piano playing, new TV, hotel smells clean and lovely. Phone in room didn’t work . Told staff member was apologetic but didn’t do anything about it . Room service made several errors also . Comfortable , clean and luxurious rooms . The room and location was excellent. Easy walk to CBD. Lots of mirrors it was confusing when you went to catch the lift. And the striped carpet in the hallways almost made me dizzy. It was so quiet in my room and the bed and pillows were so comfortable, I had a great sleep! Loved the voucher for a free drink too!